News Flash : Wisden.Auction (our sister site) buys up all the Willows Stock! Preamble : A full list of our 2000+ Wisdens are shown below, page down to see more, please note that this is just our overview page , you can click each item for more detail & several photographs of each Wisden. We are collectors (2000+ of us in fact) and hence can sell without a huge mark-up, hence 95%+ of our listings below easily beat dealer prices and we provide a proven excellent customer service! Books despatched same day! All stock shown. 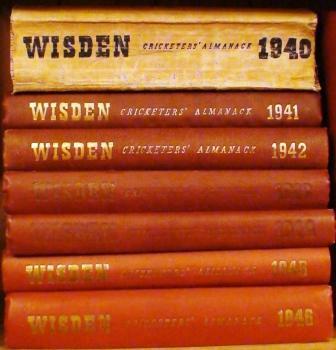 Almost all Original Wisden years are covered, if not please ask us, including many of the rare hardbacks. We have more Lillywhites for sale than anywhere else on line, please click the Lillywhite Tab below. Being collectors we know exactly what other collectors want, from beginners to upgraders hence we are proud to have the most detailed and accurate descriptions and the greatest number of photographs anywhere on the Wisden internet so please click further on the text or picture in the table below to see each item with their full details. Where applicable, our Wisden descriptions also include any facsimile gilt (lettering), facsimile spines, missing pages or library stamps which we know is crucial information when collecting Wisdens. Any questions about anything, please ask we are delighted to help and usually reply within a couple of hours. Postage reduced for multiple purchases. Lillywhites, Willows, Club Handbooks, Biogs & Cricket Memorabilia also available. Please wait a few moments while the Wisdens load below, the scroolbar on the right will shrink when ready. When I started collecting, I was trying to collect back to 1976, my birth year, I'm an avid fan and statistician so the books are ideal for me but after collecting back to 1976 a family member sent me a 1950 Hardback as a present and so I had to go back to 50, I'm was gap free back to 1876 - Not 1976!! until my final purchase in September 2010. If I was to offer 1 piece of advice to a new collector, it would be to choose either to collect any version of the book (soft back, hard back, rebind) for each year or just to go all out for hardbacks (with DJs from 65) as I ended up being far too pedantic for my own good and ended up changing from strategy 1 to 2 after owning 1950 to date and decided to upgrade from the random linens I owned to all hardbacks (then to DJs!) which cost me a fortune, if you don't mind a yellow book then a brown book then a red rebind sat next to each other, the cheapest way is strategy 1. I was terrible, my books where all are all over the place! I would also strongly prompt that if you are buying hardbacks, buy them with a Dust Jacket (after 1965), but watch out for facsimile ones. (These are Black and yellow and not colourful, if in doubt , view our collection to see what they should look like). If you see hardback, make sure it is an original hardback and not a book rebound in hardboards. Issue 1 was 1864 - 1875 is by far the the rarest - Hardbacks started in 1896 - Linen (rather than paper) backs started in 1938 - Bat book marks were present in the paperbacks from 1933 to 1939 - Dust Jackets started in 1965 with 65 to 72 being pretty rare - 1916-1919 and 1938-1946 are rare due to the wars -1963 (100th edition) has tonnes of good stuff in it (page 82) about how many books have been printed and their styles etc. The most important part about collecting are knowing which books are rare, wisden lost all its publication numbers before 1938 in a fire in WW2 so some of the numbers are unknown, but just by watching the market for long enough you can tell which books are the rare editions. Surprisingly, the rarest book is the 1875 paperback (rumour has it wisden was going bankrupt at the time) as apposed to the first edition which is believed to be the second rarest paperback, 1869 is also pretty rare. Another rare book is the 1896 Hardback - The First Hardback. Other rare editions are the books that where produced in the Wars , the 1916 Hardback being the rarest 20th century book although some debate that 1919 is rarer. The 1917-1919 & 1940 - 1945 books are known to be hard to find, especially the Hardbacks. Unknown to myself 1969-1972 are the rarest books since 1949, it is believed the 1971 is rarer as half were produced due to the poor test cricket fixture list. Original Paperbacks (1864 to date) , Original Hardbacks (1896 to 1964) , Original Hardbacks with Dust Jackets (1965 +). There are also rebound books where the spine has collapsed due to age. Rebinds come in three categories, rebound with the original covers , rebound without the covers (and sometimes adverts) and a Publishers Rebind (i.e. a book that wisden themselves have rebound). Facsimiles exist which are reprints of the Originals (usually the rare books), be aware that facsimile Dust Jackets exist also (it states this on the back page of the DJ). Recently a Big Version has been produced and leather bound books can also be found from 1995 (100 copies) 1996+ (150). Over a few years I have built up my collection and in 2008 I sold the family silver (some Rio Tinto shares) to purchase some of the rarer books. My collection is now complete after the purchase of an 1875 in September, I did own one previously (but not an 1869 at the time) but I sold my first 1875 to fund www.WisdenAuction.com , the only time my collection has been impacted on from a selling point of view. The next step for me is now to replace my 19th Century Rebinds and then the books with a facsimile spine, then to increase my hardback collection. The individual books within the cabinet are: 1864 Rebound without covers, signed (and once owned) by John Arlott, 1865 Rebound without covers, 1866 Rebound with front cover, 1867-70 rebound without covers, 1872 Rebound with Covers, 1873 Paperback with facsimile spine, 1871&2 Brown Rebinds & gorgeous from Auty Museum - 1873 & 1874 & 1875 Rebound without covers, 1876 Paperback with facsimile spine (no rear cover), 1877 Publishers Rebind without covers, 1878 Facsimile front cover but real rear cover, 1879 paperback with facsimile spine, 1880 - 1895 Original Paperbacks , and also an 1895 which is a special (alleged) publishers rebind to look like an original hardback, it is nice and quirky as the Hardbacks didn't start until 1896. 1896 Hardback, 1897 Paperback then 1898 to 1940 Original Hardbacks - 1941 Original Hardback (signed by Hubert Preston a future editor, 1936 is also a presentation copy and my 1933 was owned by George Duckworth) - 1942 to 1964 Original Hardback - 1965 to date in Original Hardback with DJs all pristine. So an 1897 Hardback is a must then to add to those original covers in the first 15. I am proud to say I recently handled an 1864 Original, hopefully it will join my set soon! Our Catalogues - Selling on behalf of members. I am very proud of all the books we have managed to place via our Catalogue, these include a very rare set of hardbacks ranging from 1898 to date - including all WW1s and many paperbacks and even some copies from the 1860s & 1870s. If you have any books for sale the catalogue is a very good way to reach several hundred Wisden fanatics. Top Ten Tips from our forum..
1) Strategy is ever so important. There are several strategies about for example buy the best condition one that you can and try to obtain or buy either hardbacks (back to a certain set year) or all softbacks. Mix and - if you don't mind a yellow book then a brown book then a red rebind sat next to each other, it is after all the cheapest way. 2) Don’t buy a Hardback post 1965 without a Dust Wrapper – you’ll only end up buying the original one day in the future and then have a spare that no one wants! Especially after 1978. PS Watch out for fake wrappers too - try and buy originals if possible. 3) Find a mentor to help you out– even if it is this forum. 4) Know the price and the rarity of the book you are buying. A 1970 is rare but not as rare as a 1940 which is not as rare as an 1875! 5) For post WW2 don’t pay too much as another will be along soon. 7) Don't panic and try to buy too many too quick as you may overspend on poor quality ones. 8) Whilst you want best quality, If you can’t wait long, settle for the best you can buy as you can always upgrade later and sell your spares. 9) Learn which dealers you should use and those you should avoid!! 10) Know the standard defects of each year, the 1948 Hardback is a hard book to find mint due to the poor quality materials used after the war – so you may have to settle for a little more rustic copy. 11) Wisden state that Print Runs before 1938 are unknown by them and are not sure how anyone else would know them! Australian Wisdens : From 1998 , for 8 years, an Australian Wisden was produced, it was like the UK version but in Green, there was also a limited edition leather set too. Bat Bookmarks : Between 1933 and 1939 Wisden issued a small bookmark tied to the book with string, it was only issued in the softback but was the shape of a bat , the handle does tend to be missing but the string is attached to the same place in each Wisden. "Benno Standard" : Brian Freed who was a forum member (he had a dog called Benno which was his user name) had to have a Wisden as close to mint as possible, hence the term Benno Standard. Brian died having a hernia operation in March 2009 and so the phrase will always be remembered. Dust Jacket (DJ) : In 1965 Wisden issued a paper wrap around to all of its hardbacks, this is the dust jacket. They are yellow. From 1965 to 1978 they have multi coloured text. From 1994 they are laminated. Facsimile DJs are also available but are just yellow and black (and state that they are facsimile on them). Ex-Library : A lot of Wisdens have been housed in a library, some do take a bit of a beating and it can mean the book is well read, have stamps inside and also a book plate from the library , they can be removed but either way they tend to hold less value than an equivalent non library Wisden. Foxing : Foxing is one of the most talked about definitions, it tends to be small (Brown?) spots within a book, usually caused by a chemical reaction over time, hence the photoplate and tissue paper are impacted the most from the chemicals in the photography procedure. It can be more than spots in sever cases , large blocks of pages can be darkened. Hardbacks : Hardbacks have been used to refer to rebound books in hardboards but the more genuine meaning of this is Original Hardback, there is nothing more of a let down than to receive and email saying I have 1930-1939 in Hardback to find they are rebound Wisdens! (See Original Hardbacks, Rebinds). Hinges : On an Original Hardback, just like with a door , the boards are attached to the main book with a hinge, in certain years, these tend to be weaker than others (1903 being the worst) , a nice test of their strength is to lay the book on the desk and open the front board to 180 degrees and release it, the best hinges will spring back and close the book, a good hinge will hold its own at 180 degress, but a weak hinge will allow the board to fall to the desk and not support itself. Worst still the hinge may be split, if so you will see gauze or webbing exposed , the biggest extreme is when te boards are coming away from the pages. Hinges are mentioned to a lesser extend in a rebind & softbacks but in poor copies it may state that they have broken hinges. Leathers : In 1995 , Wisden issued a Limited Edition Wisden, it came in a slip case was numbered and limited to 100 and was bound in red leather and signed by the editor, in 1996 (to date) 150 were issued, the first 5 go to the cricketers of the year and have their name on the front of them, Wisden allow you to keep you number going forward if you subscribe to them. Leather can also be mentioned when talking about a rebound Wisden, the replacement or New boards are sometimes in leather. Linens : Also known as Linen Cloth Covers (or Softbacks) , in 1938 Wisden changed the format of the Wisden and they replaced the Paper covers with Linen Cloth Covers, hence the formats available from Wisden in 1938 were Linen Cloth Covers and Original Hardbacks (See Paperbacks , Softbacks). 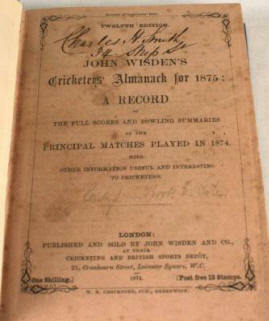 JOHN WISDEN�S CRICKETERS� ALMANACK For YEAR.� With edition to the top and the publishers details to the bottom. Original Hardbacks pre 1938 have distinctive Yellow pastedowns to the inside page and the opposite page and also to the last page and inside rear cover, Hardbacks are considerably more sought after (hence more valuable) than paperbacks, even though they started in 1896 (not 1864). The hardbacks were issues with a Dust Jacket in 1965. Not to be confused with a Hardboard Rebind (See Lettering/Gilt, Pastedowns , Dust Jacket, Paperbacks, Linens, Rebinds). Pageblock : The Pageblock is the name for the 3 sides of the Wisden other than the spine, where the internal paper ends, it is usually nice and white but in some years (like the early 1980s and late 40s) it does �brown�. Paperbacks : Paperbacks are the original style of Wisden. They tend to be called just Paperbacks rather than Original Paperbacks and are also know as Softbacks, they are Wisdens printed on paper (covers and insides) and issued by Wisden from 1864 to 1937, this format became a Linen Cloth Cover in 1938. 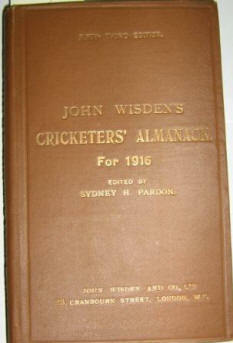 Hence the paperback was the only style Wisden sold from 1864 to 1895 (See Softbacks , Linens). Pastedowns : When you open up an original hardback from 1896 to 1937 the inside of the boards (front and back) are yellow (as is the opposite page), these yellow pages are know as paste downs (1 word or 2?) as the inside of the boards looks like this is how it was created. Photoplate : In 1889 Wisden issued a �photograph� within the book, it was a full page and accompanied with some tissue paper opposite, apart from in 1916 & 1917 it is in every year and the tissue paper stopped in 1918 where it became more modern. When Wisden changed the format in 1938, more photos appeared in the good book. Set : A set can be 2 Wisdens, I guess, but what defines a full set of Wisdens? Are facsimiles allowed? To an extreme are rebinds? The Perfect Set is described as Paperbacks (100% original, including their spines) from 1864 to 1895 , then Original Hardbacks form 1896 onwards. This would �set� you back over a quarter of a million pounds. Another set though, with facsimiles as the first 15 and rebinds (without covers/ads) could be put together for a 20th of this price. Hence a set can come in many guises. Softbacks : A collective term for Paperbacks & Linens , the floppier form of the Wisden (i.e. not Original Hardback or Rebound). (See Paperbacks , Linens). Willows : Willows have produced facsimile Wisdens over the years, they have pretty much copies all of the rare years (we just sent them a 1938 & 39 in Hardback to help produce theirs) , they have reprinted paperbacks and hardbacks and soon will have every year from 1879 to 1945.
" WISDEN is a registered trade mark of John Wisden & Company Ltd. a wholly owned subsidiary of Bloomsbury Publishing Plc. and is used under licence "